1. 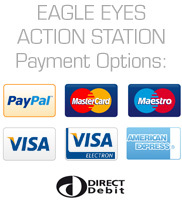 THE GOODS REMAIN THE PROPERTY OF EAGLE EYES ACTION STATION UNTIL FULL PAYMENT IS RECEIVED AND ALL GOOD WILL ONLY BE SHIPPED UPON CLEARED FUNDS. 2. GOODS MAY TAKE UP TO 28 DAYS DELIVERY PERIOD, AVERAGE DELIVERY TIME IS 3 to 5 WORKING DAYS. 1. WE OFFER TO EXCHANGE THE GOODS WITHIN 14 DAYS OF PURCHASE. ALL CUSTOMERS HAVE THE LEGAL RIGHT TO CANCEL THE CONTRACT. IN ORDER TO CANCEL YOU MUST INFORM US WITHIN A PERIOD OF 14 DAYS STARTING ON THE DAY AFTER THE GOODS ARE RECEIVED BY YOU. REFUNDS ARE GIVEN WITHIN 14 DAYS OF THE CANCELLATION. 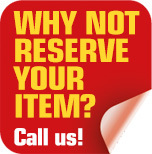 IF THE GOODS HAVE BEEN DESPATCHED TO YOU, PRIOR TO CANCELLATION, YOU SHOULD RETURN THE GOODS TO US AT YOUR COST. OUR POLICY IS TO GIVE CUSTOMER SATISFACTION - SO IF YOU HAVE ANY PROBLEMS PLEASE CONTACT US AND WE WILL DO WHATEVER WE CAN TO HELP YOU. OUR FULL CONTACT DETAILS CAN BE FOUND BELOW.